As Greece’s vibrant scene for funky hip hop and jazzy breakbeats continues to flourish, the Cold Busted label is there on the lookout. This time they’ve snatched up another high-quality release from the enigmatic Athens-based DJ and producer named mister T. The album Big Day features twelve rhythm-ready tracks, all full of bounce and swing, and many featuring talented vocalists to further spice up the mix. The diversity of mister T.’s set is shown in Big Day‘s many highlights, including the speedy breakbeat – with scratches and horns! – of “Yo”, the cheeky nu-disco funk of “This Is Not A House Track”, and the slinky strut, whispered vocals, and gritty organ riffs of “Move Like Us”. 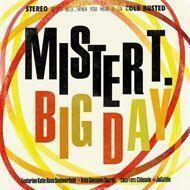 It’s prime time for mister T. … Big Day feels like a huge discovery.